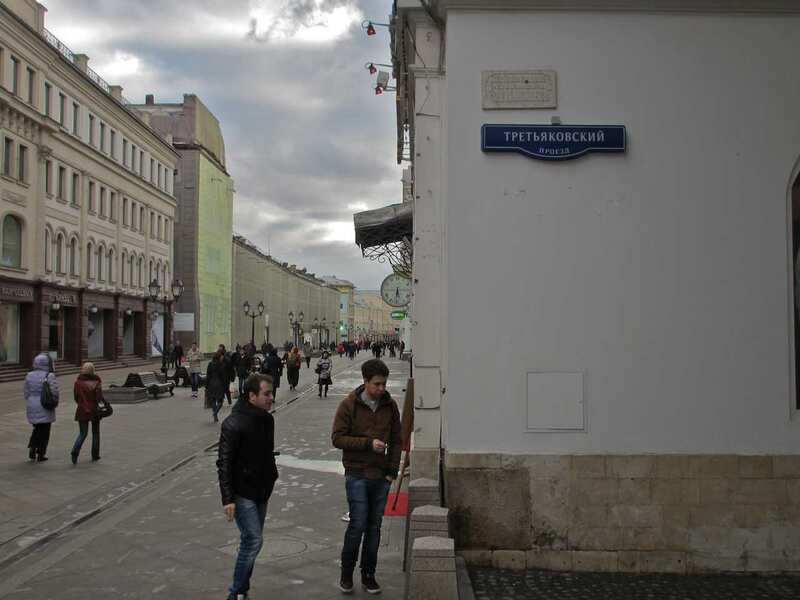 My friend Michael Nemirsky, who sometimes reads these posts, sent me a question the other day asking when most of Moscow’s memorial plaques were put up. I don’t have an answer for that grounded in hard fact, but experience tells me that most of the plaques we see these days were put up after the 1950s, some before, and on through the end of the Soviet period. Memorial plaques were one of the ways that the Soviet government paid off people who did its bidding. That’s why many of them are people with checkered biographies, while some of those people that we consider great today are not so honored. Plaques and monuments still go up in our day, but not as frequently in the past. Literally just a few hours after Michael put that question to me I happened to be on Nikolskaya Street near the Kremlin when I came upon the tiny street, even alleyway, called Tretyakovsky Passage. It was, and remains, a street that was privately built in the 1870s by the Tretyakov brothers Pavel (1832-1898) and Sergei (1832-1892) on land which originally had been built up in the 18th century. And right there in the archway leading to the tiny street was a very old memorial tablet. It is so old that it is written in the typescript that was used before the Russian language underwent a reformation that took place on Jan. 1, 1918. With that lovely old-fashioned hard sign finishing off each word or name on the plaque, it directs attention to the “Honorable Citizens P.M. and S.M. 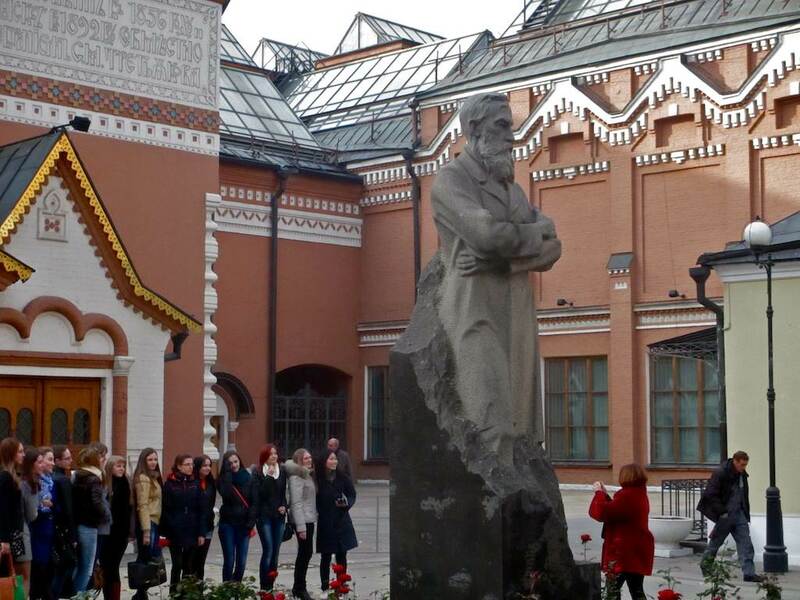 Tretyakov.” You can see the marble plaque in the first photo above. I don’t know when it was placed here on this wall, I haven’t been able to find that information. 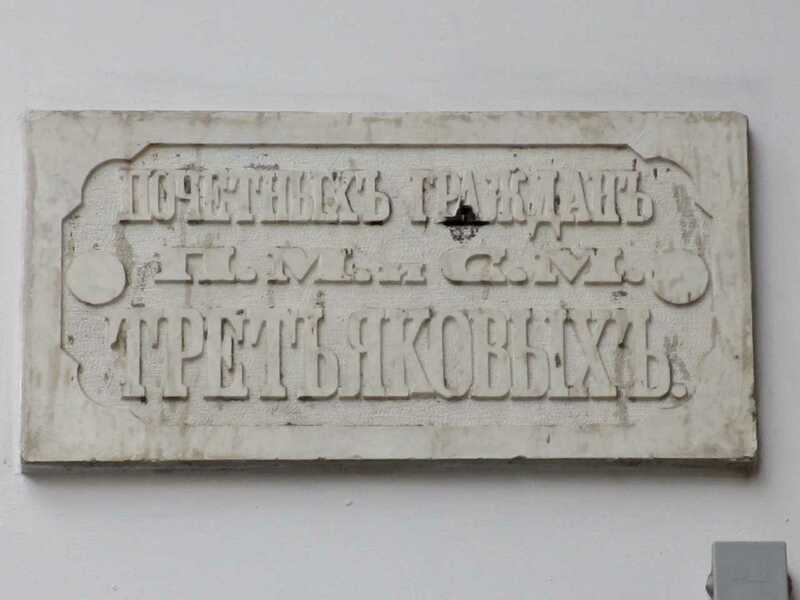 But it obviously would have been before 1918, making it one of the oldest memorial plaques in Moscow. The Tretyakov brothers – two of the greatest collectors of paintings in Russian history – began building their collections some time before they built the two rows of stores and boutiques (as we call them today). I’m assuming that art collection, even in the second half of the 19th century, was a profitable endeavor. 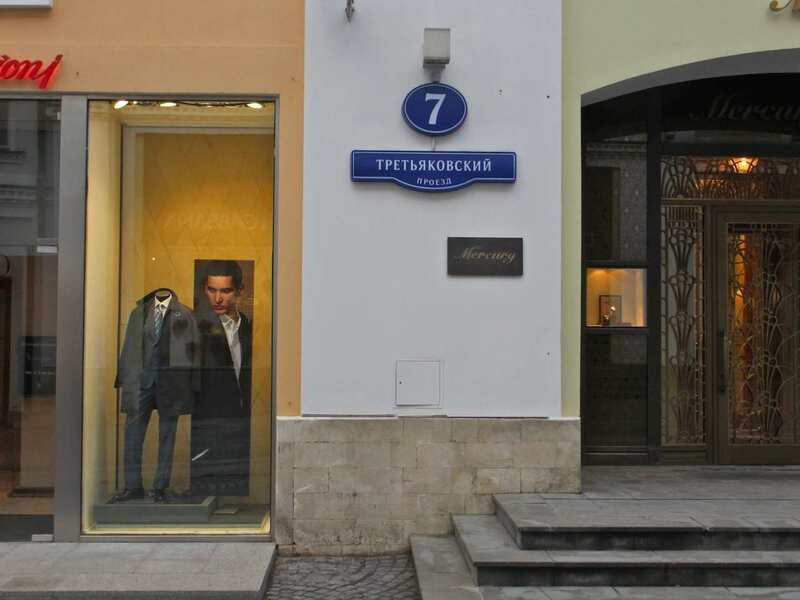 The stores on Tretyakov Passage were very respectable in their day. There were stores here which traded in furniture, tea, women’s clothing and other items. I remember a time in the late Soviet period when most of these places were empty or abandoned. 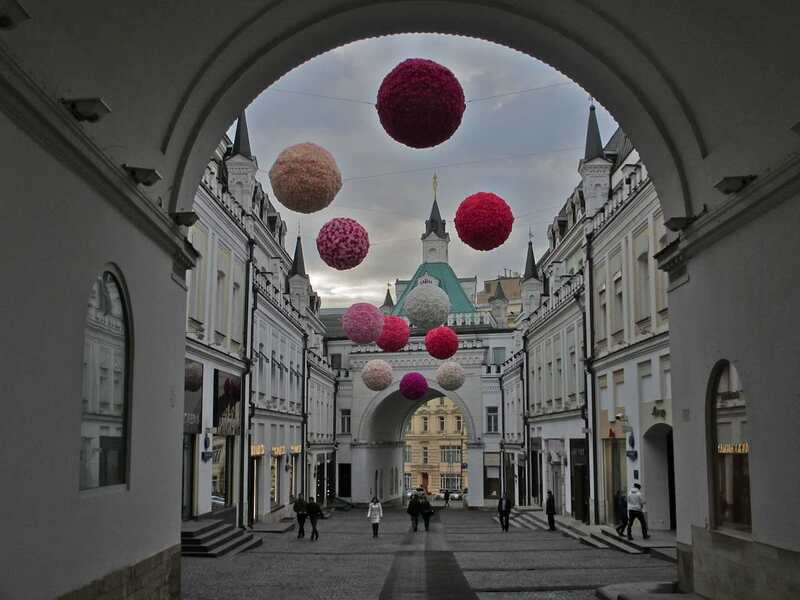 In recent years they have been resurrected and turned into one of the poshest places in Moscow. Bentley Motors, Ferrari, Maserati, Armani, Gucci, Dolce and Gabbana, Yves Saint Laurent and many other “top” western brands have outlets here. 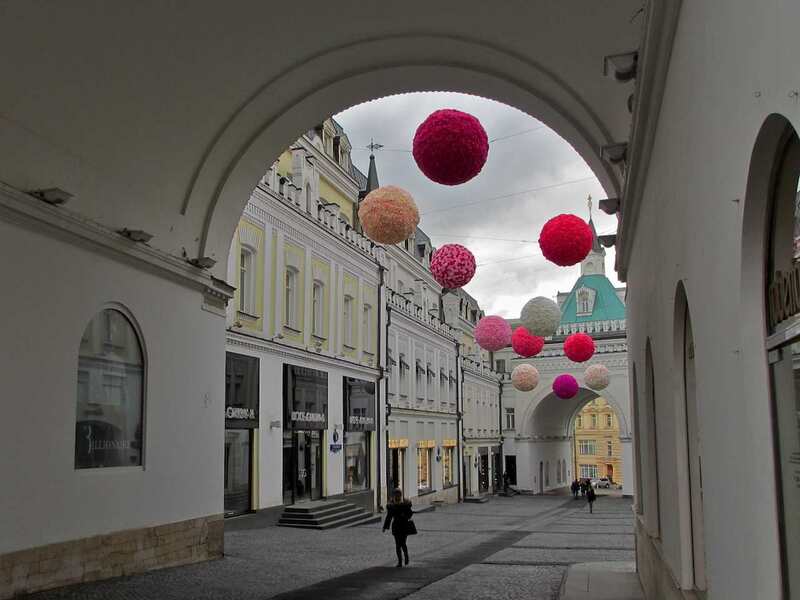 Fashion Week in Moscow is usually held in this little alleyway these days. 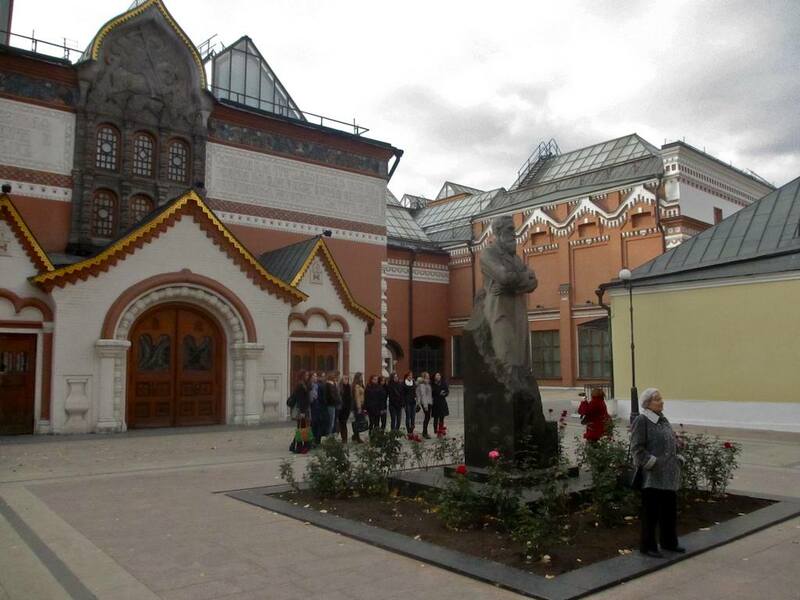 I particularly love the Tretyakov Spa, pictured above, which opens at 11 a.m. I mean, who, among the hoity-toity in Moscow are going to get out of bed before 11 a.m. to work out? After all, you don’t even have to be hoity-toity in Moscow to sleep in until 11 a.m. I don’t know if they did it by agreement or if it happened by chance, but Pavel Tretyakov, who was born in December 1832, spent most of his time collecting Russian art, while his brother Sergei, born in January the same year, primarily collected European art. Pavel’s works ended up forming the basis of the famed Tretyakov Gallery in Moscow, which specializes in Russian art. Sergei actually started out collecting the work of Russian artists too. Some of his first acquisitions were painted by Alexei Bogolyubov, Vasily Vereshchagin, Ivan Kramskoi, Arkhip Kuindzhi and others. But his heart was in collecting the European painters – Jacques-Louis David, Gustave Courbet, Theodore Rousseau, Jean-Paul Laurens, Anton Mauve, Baldomero Galofre Jimenez and many, many more. 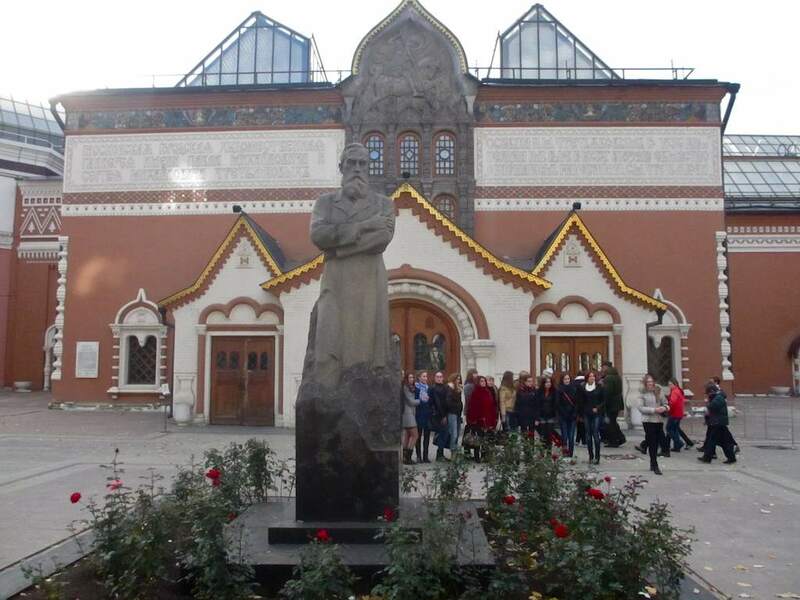 The fine arts in Russia are synonymous with the Tretyakov name. I find it has a lot more cache than all the big names tossed around on storefronts here today. 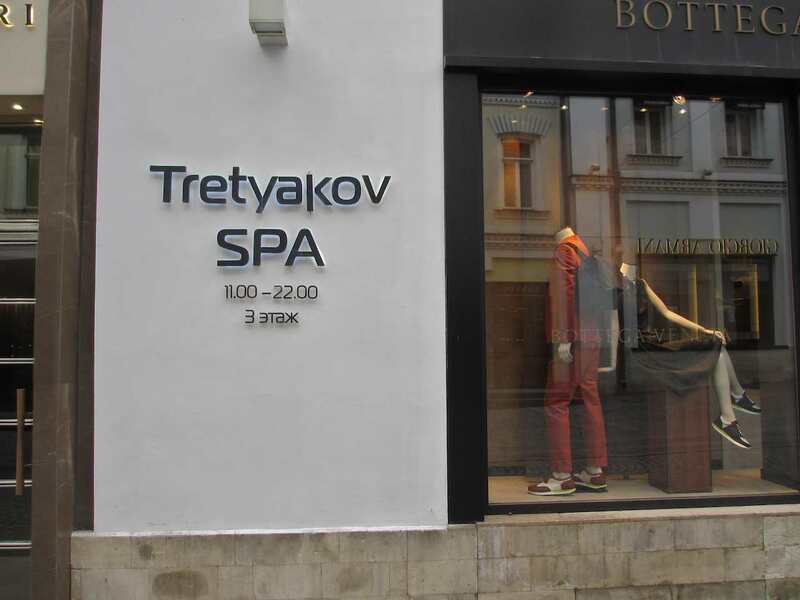 Somehow one has the feeling that something along the lines of, say, Dolce & Gabbana may be here today but will be gone tomorrow, while one senses that, whoever else may blow in here in the future, the name Tretyakov will still be in place and will still carry weight. The hotshots here lean on the Tretyakovs for prestige, not the other way around. One of my favorite places in the neighborhood where I live. When I go out for walks my autopilot takes me right here, to the Tretyakov Gallery on Lavrushinsky Pereulok, or Lane, almost 80% of the time. 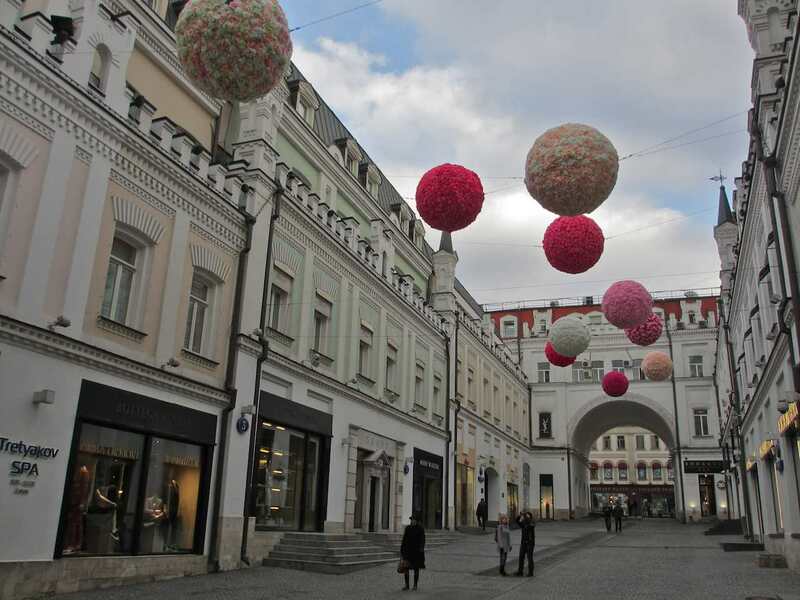 The whole surrounding area is beautiful, but the gallery and the short street it stands on are especially so. Just a few hundred yards northward is the marvelous Bolotnaya Square, with its imposing Ilya Repin statue, about which I wrote a month or so ago. 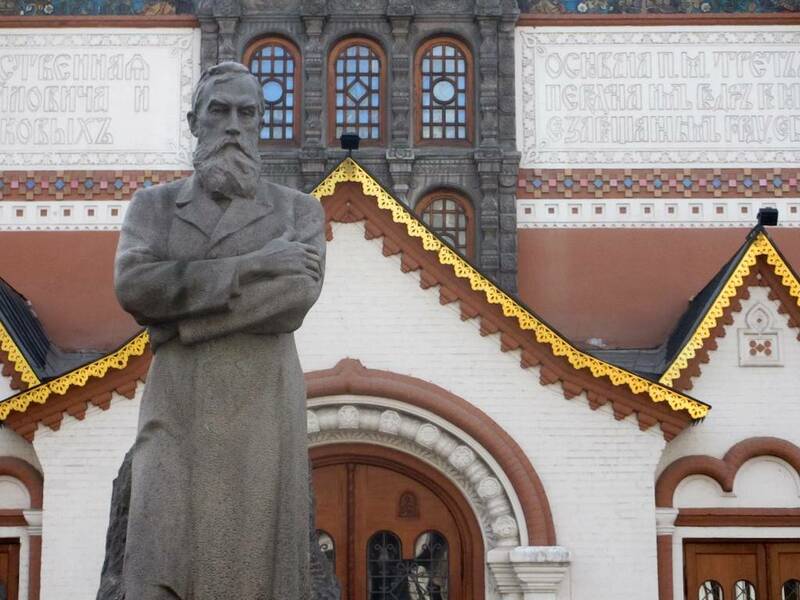 The Tretyakov is one of those incredible structures that oozes Russianness. I would hazard to say that the only other building I know like it is the stunning St. Basil’s Cathedral, about which I’ll get around to showing and telling-about some day. Pavel Tretyakov, who is the individual emerging from the chaos of granite here, was one of the great Russian philanthropists and supporters of the arts. He was an avid, not to say obsessive, collector of art, with a particular interest in Russian work (as opposed to his brother Sergei Tretyakov, who collected much European art). Even when he began collecting in his 20s he had the thought in mind of creating a national gallery of Russian art. Indeed, Tretyakov – and the curators to whom his collection was bequeathed – put together one of the most astonishing collections of Russian art ever assembled (the Russian Museum in St. Petersburg is the only competitor, and, as one who has spent many hours in both museums, I come down on the side of the Tretyakov as the leader). There are painters here of genius that almost no one in the West, sometimes even among specialists, has any notion of. The large collection of pieces by Karl Bryullov is a self-contained treasure in its own. The room dedicated to several huge (and small) works by Mikhail Vrubel is magical. My beloved Kuzma Petrov-Vodkin and Alexander Ivanov are well represented. The downstairs room of icons takes you on a breathtaking, unexpected journey through centuries of Russian spirituality. 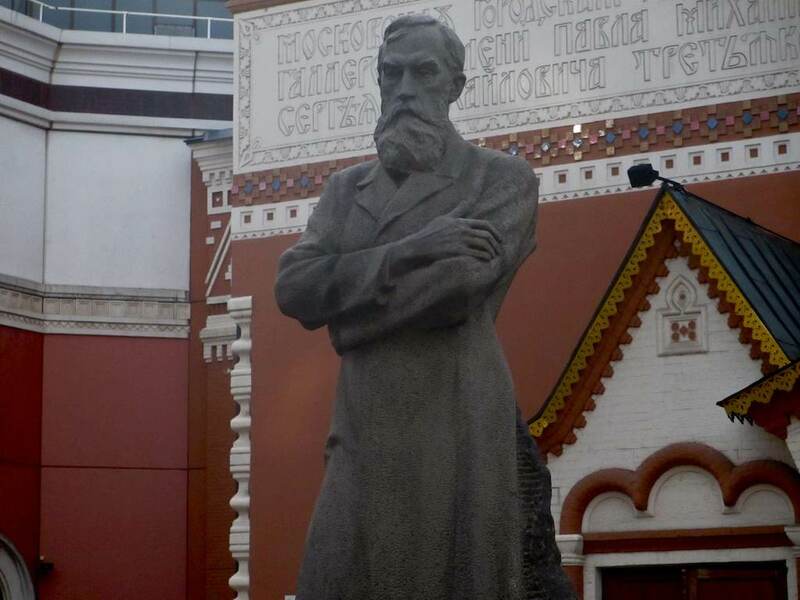 Interestingly, Alexander Kibalnikov’s statue of Tretyakov, which stands in the courtyard of the museum entrance, has only been in place since 1980. From 1939 to 1980 the position of “greeter” was held down by a large statue of Joseph Stalin, and before, that, Vladimir Lenin. Take a look at these pictures and just imagine what that must have looked like.